Faisal Shahzad Kept Low Profile in U.S.
Faisal Shahzad gave the impression of a quiet family man, raising two small children with his wife in Shelton, Conn. and telling neighbors he worked on Wall Street. Now the Pakistani-American is accused of trying to detonate a homemade car bomb in New York City's bustling Times Square. Authorities have brought terrorism and mass destruction charges against him, saying he has confessed to receiving explosives training in Pakistan. Shahzad was expected to appear in court Tuesday. CBS News reports that officials intend to arraign Shahzad Wednesday morning in Manhattan Federal Court before a U.S. magistrate. Shahzad has been talking to investigators, officials said. Shahzad, 30, was on board a Dubai-bound flight at Kennedy Airport when law enforcement took him into custody late Monday, officials said. One official said he claimed to have acted alone. Despite becoming a naturalized U.S. citizen on April 17, 2009, Shahzad spent much of the past year outside of the country, mostly in Pakistan where his wife, Huma Mian, is currently living. Details of his activities abroad remain unclear, but a picture of his life in American began to emerge Tuesday. Shahzad had been living here on the second floor of a house in Bridgeport, Conn. for a couple of months though he's been coming in and out of the U.S. for at least 11 years. He kept a low profile in his working-class Bridgeport neighborhood where people often come and go, reports CBS News correspondent Jim Axelrod. Shown a picture of Shahzad, a neighborhood woman told Axelrod, "I never saw him before." She turned out to be Shahzad's next-door neighbor. Before Bridgeport, Shahzad, along with his wife and children, a boy and a girl, lived for about three years in a two-story Colonial-style three-bedroom home in Shelton, Conn.
Shahzad bought the home for $273,000 and lost it to foreclosure last year. Frank DelVecchio, a broker trying to sell it for Shahzad, said Shahzad told him to let the bank take the house. He says Shahzad said he owed too much on it and planned to return to Pakistan. Shahzad was granted a student visa in December of 1998. He graduated from the University of Bridgeport with a computer science degree in 2000 and an MBA in 2005. He worked as a junior financial analyst for a marketing firm in Norwalk, Conn. until 2009. "I assumed they went back to Pakistan because he had talked to me previously about going back there," said Audrey Sokol, a neighbor in Shelton. "He had parents there." CBS News has confirmed that Shahzad worked until 2009 as a junior financial analyst at the Norwalk, Conn., office of a business named Affinion Group. An employee at the company wouldn't confirm whether Shahzad chose to leave the company or was terminated. A spokesperson for Affinion told CBS News that Shahzad worked for the company from 2006 to June 2009. The spokesperson refused to provide any other information other than that the company was working with investigators. Bomb Suspect: How Was He Caught? In Shelton, Conn., one of Shahzad's former neighbors told The Washington Post that Shahzad said he worked on Wall Street. The neighbor, a teenage girl who only identified herself to the newspaper as the daughter of Brenda Thurman, said Shahzad would leave for work in a suit around 6 a.m. to return around 3:30 p.m. The girl also told the newspaper that Shahzad enjoyed yardwork. "He loved to work in his yard," the girl said. "His grass was always neat. He was always outside with his daughters." The girl also said Shahzad moved away from Shelton in 2009, two months before his wife moved out of the house. Neighbors offered diverging descriptions of Shahzad but agreed that he kept to himself. One, Brenda Thurman, said Shahzad had told her husband he worked on Wall Street, while another neighbor, Sokol, said she thought he worked in nearby Norwalk. "He was a little bit strange," she said. "He didn't like to come out during the day." Sokol, a teacher who lives next door to Shahzad's old house, said that he would wave and say hello and that he seemed normal to her. Shahzad was currently living with a roommate in a mixed-race, working-class neighborhood of multi-family homes in Bridgeport, Conn. Authorities removed filled plastic bags from that house overnight and a bomb squad came and went without entering as local police and FBI agents gathered in the cordoned-off street. He became a citizen in Hartford, Conn., and passed all the criminal and national security background checks required for citizenship, officials said. The officials familiar with the inquiry say investigators plan to go through his citizenship application line by line to see if he lied about anything. The University of Bridgeport in Connecticut released a statement Tuesday saying Shahzad earned two degrees from the school in the last decade. Shahzad received a Bachelor of Science degree in computer applications and information systems in 2000, according to the statement. In 2005, Shahzad earned a Master in Business Administration degree. The university has told the federal government about Shahzad's attendance at the school, according to the statement. "The university abhors acts of violence and terrorism," Michael Spitzer, the university's provost, said in the statement. "We work to combat racial and ethnic prejudices and animosity, and believe that education in an international context is the key to understanding the values and beliefs of people from other cultures." On June 2, 2009, Shahzad departed the U.S. for Dubai in the United Arab Emirates. In July, he reportedly traveled to Pakistan and is believed to have visited Peshawar, a city known as a gateway to the militant-occupied tribal regions of the country, according to MSNBC. Investigators hadn't established an immediate connection to the Pakistani Taliban - which had claimed responsibility for the botched bombing in three videos - or any foreign terrorist groups, a law enforcement official told The Associated Press on Tuesday. "He's claimed to have acted alone, but these are things that have to be investigated," the official. 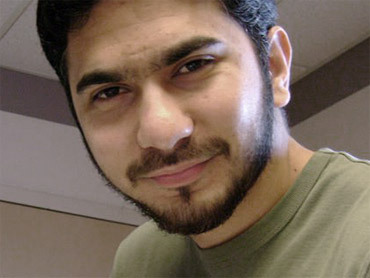 Shahzad last entered the U.S. on Feb. 3, 2010 after a five-month visit to Pakistan. According to authorities he purchased the 1993 Nissan Pathfinder used in the attempted bombing three weeks ago for $1,300. He responded to a Craigslist ad and paid for the vehicle in cash. After media reports late Monday that authorities were looking for a Pakistani-American man, Shahzad fled to Kennedy airport, boarding a flight for Dubai before law enforcement called the plane back to the terminal and the arrest was made. According federal law enforcement official, materials related to the homemade car bomb were found in Shahzad's apartment, including the boxes that contained the alarm clocks. His car at the airport contained a 9mm handgun with extra clips of ammunition. More than a dozen people with American citizenship or residency, like Shahzad, have been accused in the past two years of supporting or carrying out terrorism attempts on U.S. soil, cases that illustrate the threat of violent extremism from within the U.S. Among them are Army Maj. Nidal Hasan, a U.S.-born Army psychiatrist of Palestinian descent, charged with fatally shooting 13 people last year at Fort Hood, Texas; Najibullah Zazi, a Denver-area airport shuttle driver who pleaded guilty in February in a plot to bomb New York subways; and a Pennsylvania woman who authorities say became radicalized online as "Jihad Jane" and plotted to kill a Swedish artist whose work offended Muslims.